McEntee (L) boxing in the National Stadium. Credit: David Maher/Sportsfile. After beating Eoin Meaney and Craig Bonney en-route to the final, McEntee claimed the 60kg title with ease, beating Patryck Adamus of Drimnagh Boxing Club by unanimous decision. The ultimate round saw McEntee dominate from the off, forcing Adamus to take a count in the first round. The second round was much of the same. Terry remained on top, and Adamus was boxed into taking another count. McEntee went up another gear in the third. Adamus was fading but managed to last until the fifth. The judges crowned him champion by unanimous decision. A member of DCU Boxing since September, the Monoghan man attributed much of his success to his period in the club and particularly the sparring opportunities it had given him. The Old School clubman was narrowly defeated in the under-22s National Championship semi-finals by a score of 3-2 against Francis Cleary. The eventual winner was Patryck Adamus who McEntee had easily beaten only a month previous. Though the loss must have come as a surprise, McEntee said that he is “only back to training after Christmas break”. Speaking of his future in boxing, McEntee didn’t rule out a career in the sport. Although employing his usual modesty, he said that he is hopeful of representing Ireland in Olympics to come. 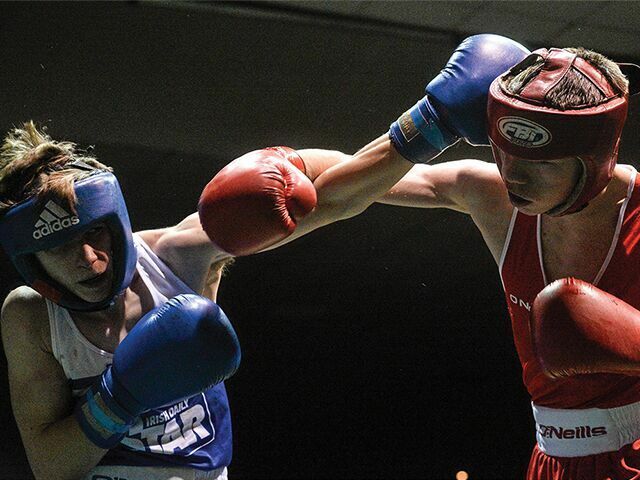 McEntee’s next big meet will at be in the Inter-varsities at the National Boxing Stadium in March. Last year DCU were the most successful University at the competition, claiming eight titles. The DCU Athletic Boxing Club will hope to emulate that success. McEntee is optimistic for the tournament and is hopeful of a St. Patrick’s Day victory. It is clear from McEntee’s ability and dedication that he is an exciting and bright prospect in boxing.